This year, Deepavali is today. In Singapore, it’s a public holiday. Next month, we have Hara Rayi Haji, and Christmas in December. Hindu, followed by Islam, followed by Christian holidays – seems like a good plan. 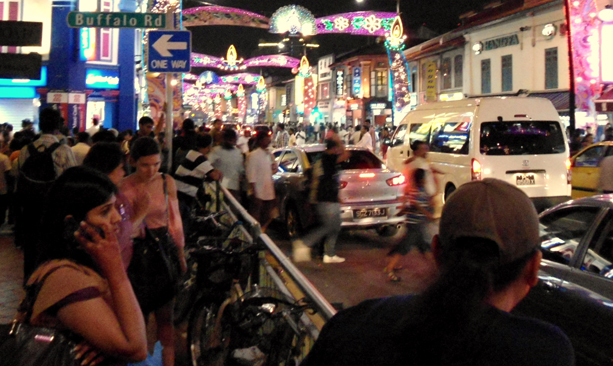 For a Hindu holiday, the obvious trip is Little India. 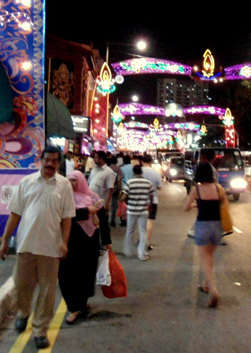 On Deepavali eve, Little India was not so little. The crowds were dense, eating, shopping, walking along the streets – sometimes in the streets – and just hanging out. Here, I felt like I was in Asia. 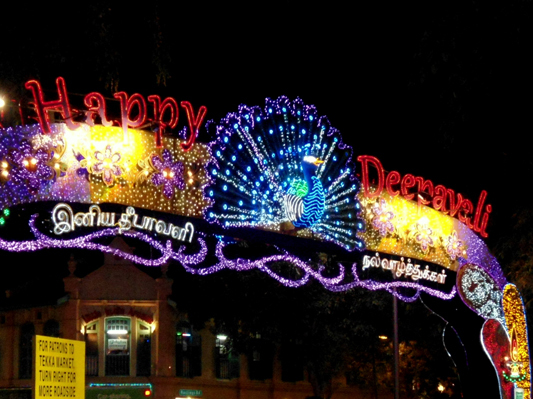 Deepavali is the festival of light, and Serangoon Street is the place to see the lights. From our apartment, it’s a fifteen minute walk to the subway station. Then, one station south to Buona Vista and change to the East-West line. At Outram Park, change again to the North-East line and alight at the Little India station. As the train got closer, the density of Indian passengers increased. Mostly young males who have, I’m sure, come here to work for awhile and send money home or build up enough funds to get married. Subway stations often have multiple exits, and there’s a locality map. The trick is to find where you’re going on the map, find the closest exit, and then figure out whether it’s a right turn or left turn out of the exit, and how many blocks to walk. It doesn’t do me any good to think in terms of compass direction because I can’t tell directions here (and I’m not sure how to recalibrate my mental compass. Yes, I know, there’s an Android app for that.) I expected a crowd streaming out of subway station, and I was surprised that there wasn’t anyone to follow. It was already dark, so I was a little concerned about launching on my own into the night, but here I was and there was no turning back. Turn left and a block away, the lights were shining. And the crowds – and cars – were streaming. Definitely the place. All the shop fronts were lit up – this seems to be a great opportunity to do some extra, end of the year, business. Sidewalks are fairly narrow to start with, and a step or two below street level. The shops all had tables or racks or some kind of offering moved onto the sidewalk, leaving about three feet between the table and the store front, and about two feet between the table and the road. In these narrow paths, was crowded … everyone! a street four lanes wide and thick with cars all, I suppose, out to see the lights. 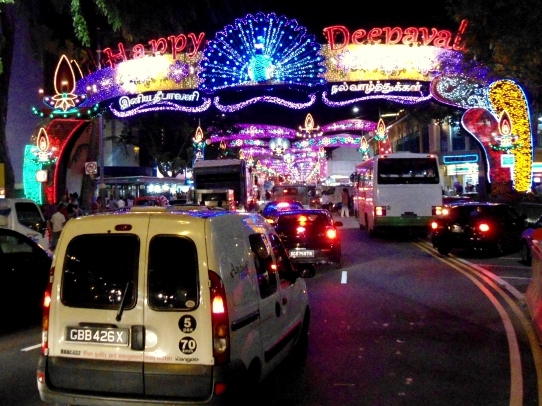 While Serangoon Street was brightly lit, the side streets were considerably darker. Some of them had a lot of people – shopping, eating, hanging out with friends and being there, as far as I could tell – and some of the side streets were full of people. Full, as in cars had to edge their way very slowly through the crowd (and what were they thinking, trying to drive through streets like that?) Down one street, about a block off the main drag, in front of a salon, there was a big crowd, loud music, drums going, shouting and hand waving. These folks were having a Good Time. Some people put their cameras in the air to get a snap of the main attraction. Whatever it was. I was reluctant to work my way through the crowd to get close enough to find out. And I was a little worried that I might not like it if I did find out. 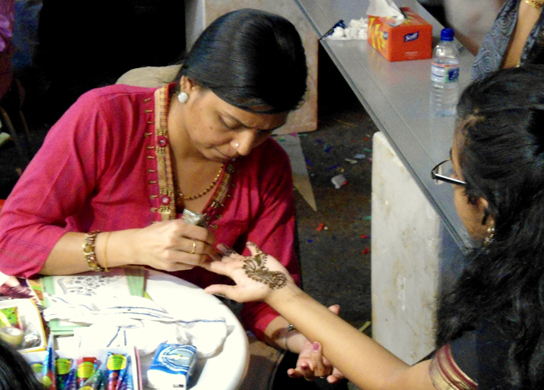 There was a good business in Indian hand painting – mehndi – on the streets. Customers were both Indian and “other”. There were baubles and bangles aplenty available. 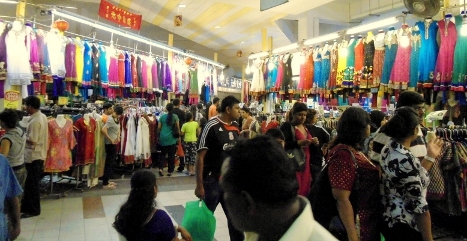 The mall was open, and I’ve never seen so many Indian dresses on the rack. There should be something for every size, taste, and occassion here – maybe not the most typical Singaporean souvenier, but the price is definitely right. And almost certainly negotiable. The temple was doing a pretty good business – big crowd congregated there, but I didn;t feel bold enough to go in. Interestingly, it was pretty unusual to see a Chinese or Malaysian face in these crowds; there may even have been more “other”. But other was still a very, very tiny minority. At 2230 (or ten thirty), it was time for me to head home again, though traffic was still pouring in. Back to the subway station where the trains on both the North-East line and the East-West line were as crowded as early rush hour. The walk home was through the warm, humid, equatorial evening, and I came through the door and turned on the aircon for the evening. Currently 82F, 84%, feels like 91F. Loved the pictures. What a good reporter you are! Wow! What a lovely adventure – I can just imagine it. Love the way you bring your observations to life!